On an all-too-regular basis, John Tribe puts his life in the hands of others. Two years ago, the 59-year-old Lewiston Orchards resident found himself needing to use a wheelchair due to foot problems brought on by diabetes. The experience has been difficult. But it’s been made worse – dangerously so – by the lack of access to a multitude of city sidewalks. One of the most ironically dangerous spots, according to Tribe, is on property owned by the city. As he tries to navigate north on the east side of Thain Road, he frequently has to steer his motorized wheelchair into oncoming traffic because of the lack of curb cuts, including at the Airway Avenue intersection where the old city library sits. It’s a risk Tribe said he is willing to take, and he does it on a daily basis. City of Lewiston officials have been struggling with how to ramp up their response to the lack of access since last year, when retired Lewiston attorney and disabled advocate Eric Peterson pushed the reboot of the dormant Disability Advisory Commission, which he leads. Peterson’s persistent complaints have pushed the city to dust off and begin to update the transition plan created after Congress passed the Americans with Disabilities Act in 1990. It has also designated an employee to coordinate compliance with the act, and restored $100,000 in the 2017 budget toward its efforts. City Engineer Shawn Stubbers said that with such a small amount of funding, Public Works is left to prioritize sidewalk construction and alteration in the areas with the most need. And that doesn’t necessarily mean putting city property like the old library at the top of the list. “We try to treat ourselves like any other business,” Stubbers said, referencing the city’s “major remodel” code that requires property owners to make frontage improvements only when they undertake a project worth more than half of the property’s assessed value. There are cases where the city can try to compel sidewalk improvements, like the recent case at the Lewiston Center Mall. The city council voted in July to declare the buckled asphalt sidewalk that runs along 19th Avenue in front of the mall “dangerous and unsafe,” and directed Public Works to require its replacement or repair. City Attorney Jana Gomez said the city has granted a request from the owners to extend the deadline for them to appeal the decision through the end of the month. Their attorney has indicated they may be able to find a way to resolve the matter, she added. Tribe said the enforcement action reinforces the irony he sees about the city pressuring private property owners to clean up their act, while some city property may be just as dangerous. Stubbers said that is not a bad point, but he again pointed to the city’s goal of prioritizing what work is most needed, regardless of ownership. And access improvements don’t just serve the disabled, he added. They have a “multimodal” purpose of improving safety for pedestrians and improving the public’s ability to use transit services like city buses. Public Works is in the thick of the prioritization process, working with the Disability Advisory Commission to rank the transportation corridors that need improvements the most, and the ones that will provide the most continuity with projects that have already been completed. City officials are frequently criticized for building “sidewalks to nowhere,” or requiring developers and property owners to build them. But Peterson said that even though the logic of some sidewalk construction might not be immediately apparent, there is a method. Commentators at recent city council meetings have been especially critical of plans to build sidewalks along the northern and western frontages at the WinCo Grocery store since they don’t immediately connect to other sidewalks. But Peterson said they will connect, especially on 19th Avenue, which will lead to accessible sidewalks on 21st Street and Thain Grade. The 17th Street sidewalk is another story, since it will only lead partway up a steep hill that has been increasingly used by pedestrians, largely due to the completion of a large apartment complex near the top. City officials have said there simply isn’t enough money to build a complete sidewalk up the grade. Grant money is rare, but still available for certain projects, Stubbers said. But they have to include certain aspects to win the stiff competition for funding. An example is the work done over recent years to add sidewalks and curb cuts on 14th Street and 18th Avenue. Those grant applications were successful in part because the work was done near schools and transit access points, he said. The city also gets an annual federal appropriation to help fund its transit services, and any money left over has been used for capital projects like sidewalks and curb cuts. And there is the $100,000 the council elected to include in the budget. But that money can only go so far. Peterson said the Disability Advisory Commission is recommending that $15,000 be used to start an edge grinding program, where a special machine evens out the heaved sidewalks and damaged curb cuts that can stop a wheelchair cold. Another recommendation is to use $50,000 to hire a consultant to help finish the transition plan and integrate it into the city’s various master planning documents. City Councilor Bob Blakey made the motion to increase the disabled access appropriation to $100,000 after it became a bit of a football during recent budget negotiations. It was initially programmed at $50,000, then reduced to $35,000, then restored to $50,000. But at the 11th hour, Blakey proposed taking another $50,000 from the council’s contingency fund to beef up the effort, and the rest of the council went along. He disagreed with Tribe that the city should take care of its own property before dedicating funds elsewhere, or taking action to compel property owners to make ADA improvements. He said the city has done a great job of putting extra value into its street projects by including access improvements in the designs. But he acknowledged that $100,000 is just a drop in the bucket for a city like Lewiston, which has vast reaches in its street network with no sidewalks or inaccessible sidewalks. The potential lawsuits or federal sanctions due to inaction on ADA compliance has been a major motivating factor for the city to at least get started with its efforts. 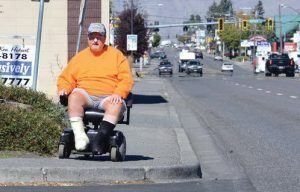 But according to the executive directors of the Association of Idaho Cities and the Idaho Counties Risk Management Program, adverse actions based on public ADA access have been virtually nonexistent. That risk might be more acute for cities that have aging infrastructure like Lewiston, he added. Still, the issue of public ADA access hasn’t been causing much anxiety among his member cities. Rick Ferguson at Idaho Counties Risk Management Program said he couldn’t think of a single case against an Idaho municipality. Ferguson said he is knowledgeable about claims like excessive use of force by police departments, and civil rights claims against cities and counties. But he doesn’t know much about ADA, and how it applies to public infrastructure. “My lack of knowledge is kind of indicative of the fact that it’s just not been a significant risk area,” Ferguson said. That doesn’t mean government organizations in Idaho are completely immune from action. Last year, the state reached a $400,000 settlement with the U.S. Department of Justice over the lack of disabled access included in the $120 million remodel of the Capitol. Even though the city’s exposure to lawsuits or the withdrawal of federal funding may be overstated, it doesn’t mean increasing the safety of, and access to, sidewalks isn’t the right thing to do. Tribe recounted another hair-raising story of trying to get his chair down the 17th Street grade, again by using the roadway. Tribe turned around to see a vehicle sideways in the road, skid marks trailing behind. Mills may be contacted at jmills@lmtribune.com or (208) 848-2266.